Some with sleep-onset insomnia find high-tech offerings such as Napflix and the “Sleep With Me” podcast ease the transition from wake to slumber. Technology is often seen as the enemy of sleep. 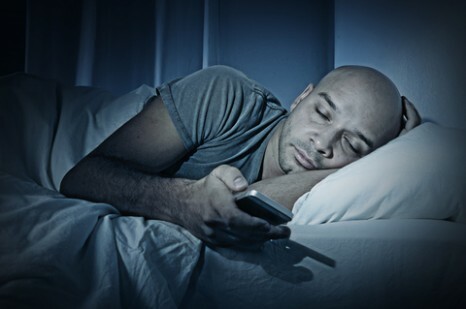 In fact, one of the most common tips given people who suffer from insomnia— which is as many as 70 million Americans—is to remove digital devices from the bedroom. Sleep should be preceded by a wind-down routine, experts say, and watching or listening to phones, tablets, and TVs can interfere with that process. The stories they tell can be too stimulating, and the screens themselves emit melatonin secretion-disrupting blue light. Plus, using the bedroom for anything other than sleep and intimacy mars the association between bedtime and sleepiness, or so goes the standard advice. But several high-tech sleep aids have popped up in the last few years that turn that advice upside down. Rather than banish devices from the bedroom, these services make use of them, offering sleep-oriented programming meant to help people turn off their own thoughts in order to get some rest. Napflix, which launched in October, is one of these services. Created by two Spanish entrepreneurs, the streaming service promises to take the siesta to the “next level” by offering footage so boring the viewer can’t help but drift off. Since boring is in the eye of the beholder, their collection includes a wide variety of videos: religious ceremonies, royal weddings, rainfall, cricket matches, and a recording of a model train set that goes on for almost an hour, among others. For a CNet reporter who tested the service, a televised curling match proved too exciting for sleeping purposes but a 45-minute video of a zen garden provided the perfect level of under-stimulation. Although it sounds like a parody, Napflix is tapping into a market that even long-standing streaming services are trying to attract. In August, Netflix added a Norwegian-produced series called SlowTV. The first episode follows an uninterrupted train ride from Bergen to Oslo, a journey that takes over 7 hours. Subsequent episodes feature hours of knitting, log burning, and salmon fishing. Amazon Prime offers the Window Channel, which mimics the experience of looking out the window in a series of beautiful places around the world. Are these simply newer versions of the white noise machines that have been around for decades? Perhaps. But a story-telling podcast that launched in 2013 might be the most original new sleep aid—or “sleep offering,” as its creator prefers—on the scene. Each episode of Andrew Ackerman’s “Sleep With Me” features Ackerman telling long, fanciful, meandering bedtime stories for adults. To record the podcast, Ackerman slips into an alter-ego he calls “Dearest Scooter.” Scooter’s voice is low and mumbly, almost as if he himself is about to fall asleep. The stories are a hit: each episode is downloaded about 100,000 times and the podcast is typically among the top 100 most popular on iTunes, sometimes breaking into the top 50. Listener-reviewers rave that the show has saved them from sleepless nights, many noting that they rarely know how any of Scooter’s stories end. By the end of the episode—which usually lasts just over an hour—they have fallen asleep. Ackerman says that the trick to telling a good bedtime story is to find just the right level of boring. “I don’t want it to be total nonsense but I like to go on these long tangents so people’s common sense says, ‘Oh I don’t really need to be paying attention to this guy,’” he says. Listening to Scooter’s flights of fancy can feel like tuning in to someone else’s dream. But each episode is put together with a lot of thought. He’s learned to avoid topics that rouse people. You won’t find any violence or political discussion in Scooter’s stories, and he has learned not to mention snakes or spiders. Through trial and error, Ackerman crafts stories that he says hit a soothing sweet spot for most of his listeners. And if a certain episode doesn’t cut it for someone, there are plenty of others to try—Ackerman releases about three episodes per week, and there are at least 300 in the archives. Emerson Wickwire, PhD, director of the insomnia program at the University of Maryland School of Medicine and member of Sleep Review’s editorial advisory board, says services like Sleep With Me and Napflix work by facilitating the wind-down period that people need to shift from awake to asleep. “Of the applications I have seen, they are better than reading email, for sure. And, they are inexpensive and easy-access. But in the long run, they are not nearly as effective as the kind of personalized wind-down rituals that can really help patients achieve the sleep they need and rest they deserve,” he says. For his part, Ackerman resists the idea that his podcast is meant to lure people into sleep. Instead, he thinks of it as a form of digital companionship, a friend who sits with you in the dark of night, whether you’re awake or asleep. “Everyone who’s struggling to fall asleep is not just struggling with the sleep hygiene side but is struggling with the human being side too,” says Ackerman, who adds that some of his listeners deal with chronic pain. “People are telling themselves stories anyway. ‘Oh, this pain’s going to keep me up and I’m never going to fall asleep and I’m going to have a terrible day tomorrow,’” Ackerhman says. The podcast gently replaces that story with a different one. It’s also something to look forward to at night, he says, easing the dread that many people feel around bedtime. Whether digital sleep aids like Sleep With Me or Napflix are tools that sleep experts feel comfortable recommending, there’s no question that many who suffer from insomnia are using them. Wickwire thinks that no one should feel guilty about finding a way to get the sleep they need. “In general, my approach is ‘if it ain’t broke, don’t fix it,’” he says. But there may be some patients for whom these unconventional solutions are not enough.